Muriel has missed only one Gathering since its inception – last year’s when she was at a Slack Key festival in Hawaii. 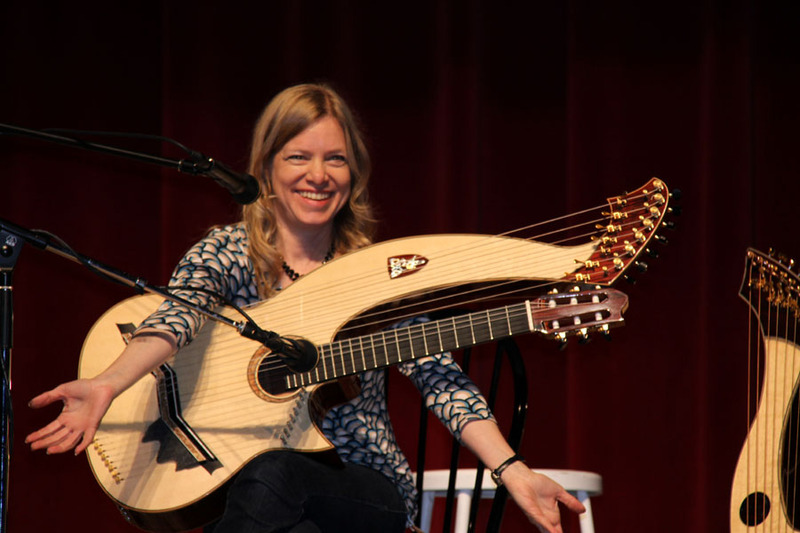 She’s been featured a couple times, with the latest turn a workshop on the whys and wherefores of playing and composing for 3 different harp guitars: nylon-string, steel-string, and super-trebles. 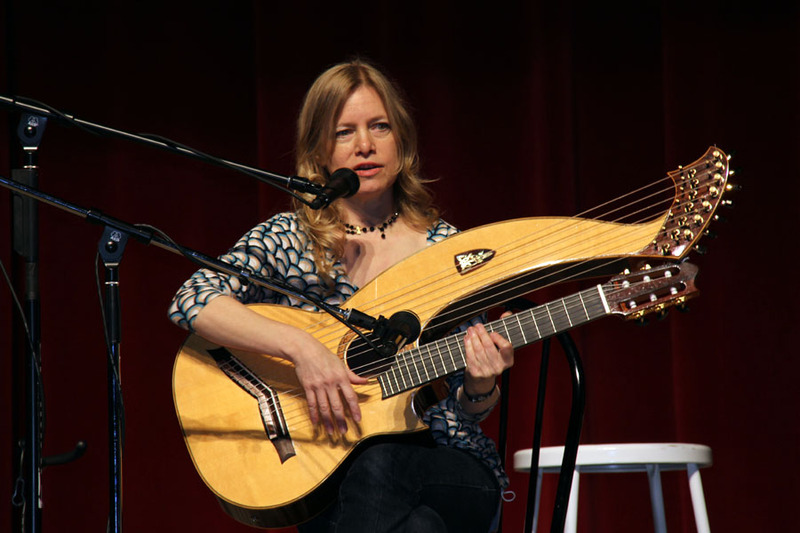 The nylon-string is of course her original Mike Doolin “harp requinto,” tuned a third higher. She now has a special set of GHS nylon basses made for this instrument, and has made some sets available through Harp Guitar Music (which I’ll post shortly). Her original harp guitar was a steel string (as her initial introduction to the instrument was Michael Hedges) made by Del Langejans. She had to retire it due to its size. 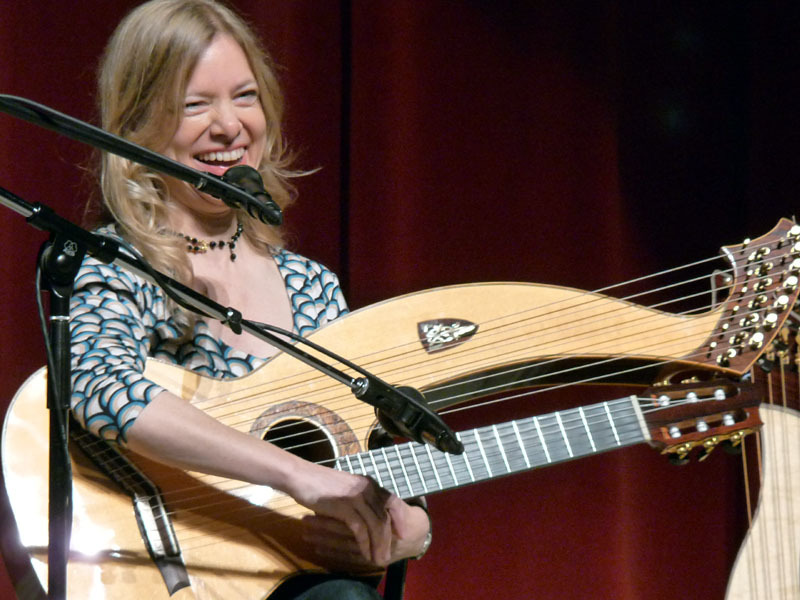 After borrowing a modern steel-string HG from Benoit while on tour in Europe with Tierra Negra, she decided that the steel-string was a better contrast with the two nylon 6-strings played by the duo, so upon returning to Nashville, she commissioned local luthier David Taylor to build her a small steel-string. David didn’t make it to the Gathering, but I hear he is building a second one of these. I can tell you that I agree with Muriel that David is one of the best kept secrets in modern lutherie – his guitars sound fantastic, and he doesn’t yet know how good he is. 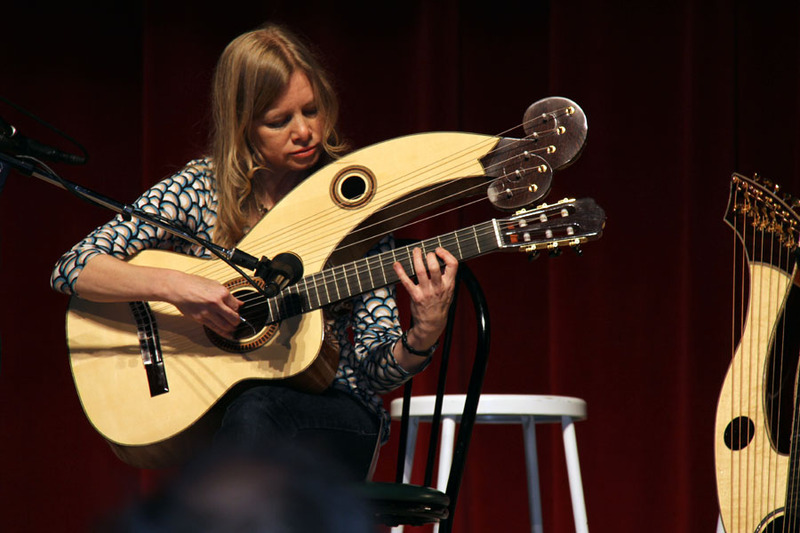 Muriel’s latest is another Doolin nylon-string, but with an additional 8 super-trebles. I think we all know where she got that idea … and by coincidence, the new Muriel Anderson / John Doan Harp Guitar Duos CD arrived the day before the Gathering (though she doesn’t play the new Doolin on it, leaving [for now] the treble duties to John). She played a bit of 2 brand new arrangements on the new instrument that I am pleased (and honored) to say that I “commissioned” (i.e. : suggested by way of a challenge, or even a dare, if you like!). If all goes well (and so far, the works-in-progress are amazing), these are destined for the next 2 HGM compilations scheduled (and half completed) for next year. 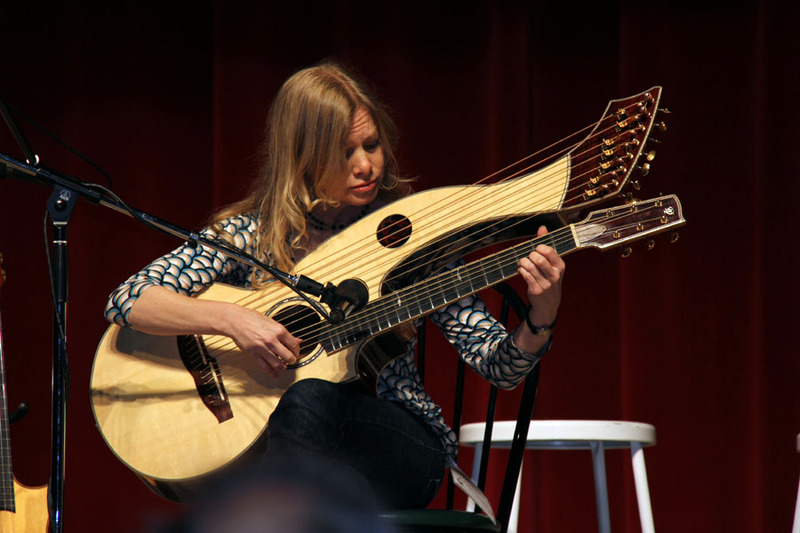 Muriel even had a fourth harp guitar – a terz-tuned, short-scale harp guitar Mike Brittain built with her in mind. I was joking of course (no, we didn’t use that one), but seriously – the question will one day need to be asked!